Multi use adhesive that provides a quick grab. Dries white and can be overpainted. Adheres to most common surfaces including wood, plasterboard, stone and concrete. Instant Nails Solvent Free Grab Adhesive 310ml White is rated 4.7 out of 5 by 83. Rated 2 out of 5 by Nicola117 from Online purchase store collection I bought this online and went to collect in store but couldn't find my order number and the Scunthorpe branch said as they have nothing to do with the online side of the company I needed it but in the end gave me the product . Rated 5 out of 5 by S1RDG from Just the job. Bought 5 tubes to re stick skirting and architrave that i had removed. It worked a treat. Very good value for money. 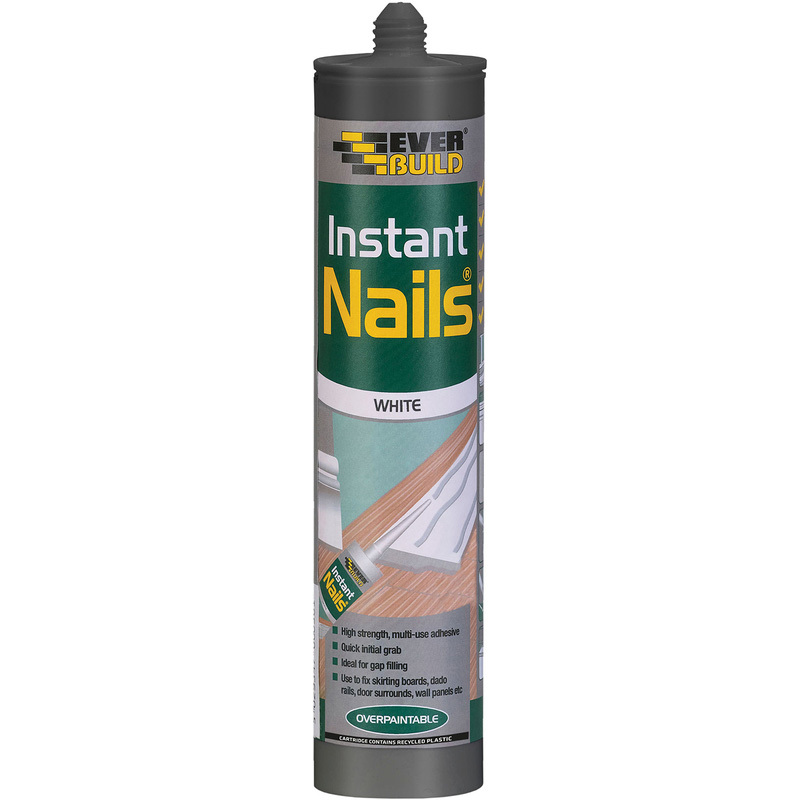 Rated 5 out of 5 by colinw1872 from Instant Nails I used this in 2 bedrooms to replace Architrave around 2 doors both sides and around 2 double doors of built in wardrobes one side only, total over 22 metres.. Fitted over 35 metres of Skirting board all without any problems. The adhesive stays soft enough to allow movement before finalising. Excess can be easily wiped away with baby wet wipes which will gives a smooth edge. This was the cheapest of this type of adhesive, but has excellent results. Rated 4 out of 5 by Alun257 from Did what it said Did what I wanted it to do. There night be better on the market but for the price it was great.